Posted in 47, AEthyr, Air, Alchemical, Alchemical Great Work, Alchemy, Alter Man 47, Alternative, Alternative Energy, Alternative Fuel, AM47, Ceremonial Magic, Classical Elements, Earth, Fire, Magic, Magical, Magick, Occult, Platonic Solids, Water with tags Alchemical, Alchemical Miso Soup, rice noodles, rice-cooker on 9 February 2014 by Jack F.
AM soup brings new meaning to “soul food”. 1. FIRE = pour 5 tablespoons of olive oil into a rice-cooker and add fresh chopped garlic, jalapeno, and veggie bullion, then heat* ’till bubbly and slightly smoky and golden. 2. WATER = add 5 cups of water and wait for it to slow-boil. 4. EARTH = add fresh chopped coriander, turmeric, mushrooms, etc., and stir in 5 tablespoons of miso paste. 5. AETHYR = add 3 eggs*, consecrated by the method of your own choosing, and cut the heat off. Eat in the dark while watching a damn fine horror film. *careful, they cook/heat fast! And note that many rice-cookers will need to have the on-off button wedged to stay ON, so watch it!! 2014 Olympic Flame Alchemy in 47 seconds! Posted in 47, AEthyr, Air, Alchemical, Alchemical Great Work, Alchemical Voyage, Alchemy, Alter Man 47, AM47, Ceremonial Magic, Ceremony, Circumnavigation, Classical Elements, Documentary, Earth, Fire, Magic, North Pole, Occult, Platonic Solids, Project AM47, Sacred Geometry, Sidereal Astrology, Synchronicity, synchronicity generation, Water with tags Olympic Torch, Olympic Torch Relay, The Olympic Flame on 7 February 2014 by Jack F.
The 8 Arctic Nations surrounding the 2014 Olympic Torch at the North Pole. (23 FEB 2014) Fun Fact: After that little “Alchemical Blessing”, Russia “won” the 2014 winter olympics with a total of 33 medals in all, 33 supposedly being the highest freemasonic rank. Posted in 47, Alchemical Great Work, Alchemical Voyage, Alchemy, Alter Man 47, Alternative Energy, Alternative Fuel, AM47, Archaeoastronomy, Astroarchaeology, Astrocartography, Astrology, Baker Beach, Balsa Man, Burning Man, Burning Man Event, Burning Man Project, Ceremonial Magic, Circumnavigation, Classical Elements, Collaborative Art, Fire, Investigative Mythology, Leo, New Age, Occult, Point of FIRE, Sacred Geometry, Sailing, San Francisco, Ship, Sidereal Astrology, Speculative Fantasy, Speculative Fiction, Synchronicity, synchronicity generation, Vision Dream, vision dreaming with tags 47, Alchemy, alternative energy, AM47, Archaeoastronomy, astrology, Burning Man, Burning Man Event, Burning Man festival, Burning Man Project, Circumnavigation, Lucid Dream, Magic, magick, Metaphysics, Occult, sacred geometry, San Francisco, sidereal astrology, Speculative Fantasy, Synchronicity, Vision Dream on 11 January 2014 by Jack F.
The San Bruno Fireball of 09 Sep 2010, 10 miles directly south and 7 days after the AM47 Point of FIRE. Four locations in perfect cross-quarter formation around the world are naturally manifesting the characteristics of the 4 Classical Elements of ALCHEMY. The goal of Project ALTER MAN 47 (AM47) is to film the journey of an alt-fuel ship that will circumnavigate the globe to connect all four of these points, one every three months, over the course of a year and in so doing help raise the magical Awareness of mankind. 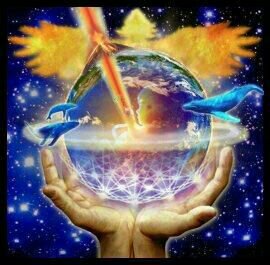 The timing of the voyage is set to the ancient Egyptian/sidereal astrological year. Departing from the Point of FIRE in San Francisco, to the Point of WATER off the coast of Japan, to the Point of AIR in Turkmenistan, to the Point of EARTH in the Azores, and back to the Point of FIRE in San Francisco to complete the circle. When the Sun aligns with the direct center or “Angel Point” of sidereal Leo, the Point of Elemental FIRE (PoEF) can be expected to manifest in the inspired city of San Francisco, CA, USA. The next PoEF is on 01 Sep 2012 (and then again on 31 Aug 2013, etc.). The AM47 ship was scheduled to have departed from San Francisco shortly after the PoEF on 02 Sep 2011, but sadly the required publicity and subsequent funding for the project was not secured in time for this years attempt. The exact location in San Francisco where the PoEF will be held next is yet to be determined, but there are a few good spots under consideration. Currently, Baker Beach, the location of the original Burning Man event in 1986, is being used as a general base point to plot the other three points around the globe. There are many cultural and spiritual dimensions to this most progressive city, but some in particular are of direct relevance to Project AM47. The annual Burning Man festival began in San Francisco and is currently celebrated in mid-sidereal Leo, FIRE! The recently formed Burning Man Project Non-Profit is based in downtown SF. One of the many missions of the BMP is to build an “urban cultural center” in San Francisco that will provide, among other things, sites for FIRE ritual and ceremony! AM47 is currently (2012) seeking to coordinate with the BMP to determine the location of these ritual sites. There, the crew of the AM47 was/is to generate, observe, dedicate and send Elemental FIRE into Awareness. Posted in 47, Alchemical Great Work, Alchemical Voyage, Alchemy, Alter Man 47, AM47, Burning Man, Burning Man Event, Burning Man Project, Ceremony, Fire, Leo, Manifesting, Point of FIRE, San Francisco, Sidereal Astrology, Synchronicity on 26 August 2013 by Jack F.
The YRFire began on the same day that the Sun entered sidereal (ancient Babylo-Egyptian) Leo, 17 AUG 2013. The YRFire is directly on the latitude of Project AM47. 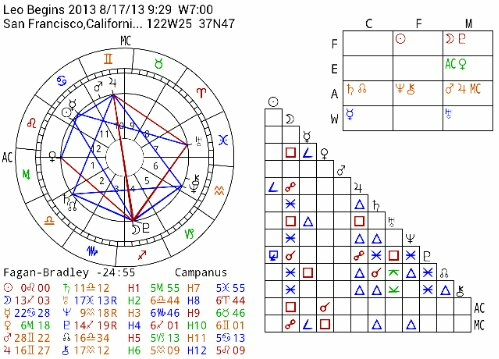 The AM47 Alchemical Point of Elemental FIRE is in San Francisco on 01 SEP 2013, dead center of sidereal Leo (which is also the same day they burn the Man at Burning Man). San Francisco is under a state of emergency due to the fire threatening power and water to the city. Another tragic portent in a dying world, too damn stupid to know a good thing when they see it. State of Emergency declared for San Francisco due to wildfires 7 days before the AM47 Alchemical Point of Elemental FIRE in S.F.! Posted in 47, Alchemical Great Work, Alchemy, Alter Man 47, AM47, Burning Man, Burning Man Event, Burning Man Project, Fire, Leo, Magic, Magick, Occult, Point of FIRE, Sacred Geometry, San Francisco, Sidereal Astrology with tags Brown, California, Hetch Hetchy Reservoir, Infrastructure, Jerry Brown, San Francisco, State of emergency, Yosemite National Park on 24 August 2013 by Jack F.
Shot of the Great Yosemite Fire of 2013 on August 24th from the Space Station showing the enormous smoke plume and the fire creating it’s own weather system. The Sun entered Sidereal (ancient Babylo-Egyptian) Leo (FIRE) on 17 August 2013. 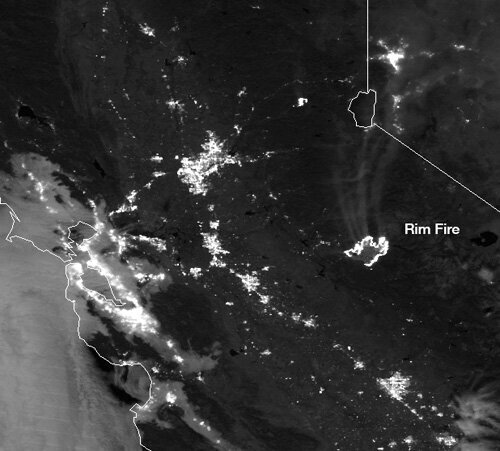 The Great Yosemite Fire was sparked by lightning on 17 August 2013. On 23 August 2013, Gov. Brown issued a State of Emergency for San Francisco due to possible damage to electric and water infrastructure. The ALTER MAN 47 Alchemical Point of Elemental FIRE is on 01 September 2013, at the “Angel Point” / mid-Sidereal Leo, in 7 days. As of today, 24 August 2013, the Fire is already the second biggest CA Fire in history and still only 5% contained. 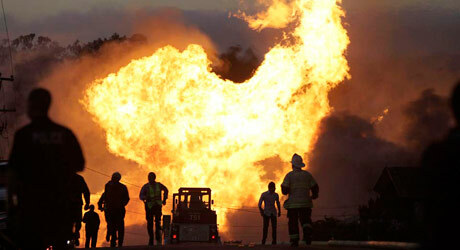 If this Fire takes out the power and water to San Francisco, we may well see a Point of Fire like no other before it. Note how the Fire is directly in line with San Francisco, on the latitude of Project AM47. Happy Birthday and Solar Return to all Sidereal LEO’s beginning today! Right Now!! Posted in Alchemy, AM47, Archaeoastronomy, Astroarchaeology, Astrology, Egypt, Egyptian, Fire, Investigative Mythology, Leo, Occult, Point of FIRE, Pyramid, Sidereal Astrology, Suez Canal, Synchronicity on 17 August 2013 by Jack F.
The Sun enters Sidereal Leo today, 17 August 2013 @ 09:29 PST. Happy Birthday and Solar Return to all Sidereal Leo’s beginning today! Excellent summation of Sidereal Leo on this Western Sidereal Astrology site. More Sidereal Leo on The Siderealist. And Sidereal Leo on Nostredame. Detailed information on Sidereal Astrology on The Lunar Planner. The age of the Sphinx is still unknown. The head was most likely that of a lion or perhaps a jackal. With all the turmoil in Egypt today, what if there really IS a hall of records under the Sphinx and what if muslim extremists dig it up and burn it?? From the Boston Bombings into the giant, early Malibu Fires during Sidereal Aries and beyond. Posted in 47, Alchemical Great Work, Alchemical Voyage, Alchemy, Alter Man 47, AM47, Astrology, Awareness, Divination, Fire, Occult, Point of FIRE, Project AM47, Prophecy, Sacred Geometry, Sidereal Aries, Synchronicity, Zodiac with tags 47, AM47, astrology, fire, Magic, magick, Metaphysics, Occult, sacred geometry, Sidereal Aries, sidereal astrology, Synchronicity on 3 May 2013 by Jack F.
The Sun and Mars were conjunct as they entered SIDEREAL Aries on 15 April 2013. Sun + Mars + Aries = FIRE, heat, anger, violence, explosions, confrontation, etc. 5. The giant early Southern California wildfires crowned this Firey episode coast to coast by igniting on 01 May 2013, the center of Sidereal Aries. The Fire’s relatively early ignition was as the Sun conjunct Mars hit the center (or “Angel Point”) of Sidereal Aries (Cardinal FIRE)… This is just the tip of the inferno.